In the past two weeks, a new image or rumour relating to the Xiaomi Mi 6 has been surfacing online every day revealing various features. According to a new image leaked online, the upcoming flagship phone from Xiaomi will feature an IRIS scanner, same as the Galaxy S8 and S8+, and will also retain the front-facing fingerprint scanner from Xiaomi Mi 5. As you can see in the image above, the IRIS scanner can be clearly seen between the earpiece and front-facing camera. The IRIS scanner was first introduced in the Galaxy Note 7 by Samsung, and it helps to unlock the phone with your eyes securely. Another noticeable thing in the image is the design of the phone. The Xiaomi Mi 6 will not feature any infinity or bezel-less display because the Apple of China has the Mix series exclusively for that segment. So, the Mi 6 might not feature an edge-to-edge display. Xiaomi seems to be all over the place with the placement of fingerprint scanner. The Xiaomi Mi 5 came with a scanner embedded into the home button of the phone, whereas the Mi 5s Plus has a rear facing scanner below the camera module. They returned to the front-facing scanner with the Mi Note 2. 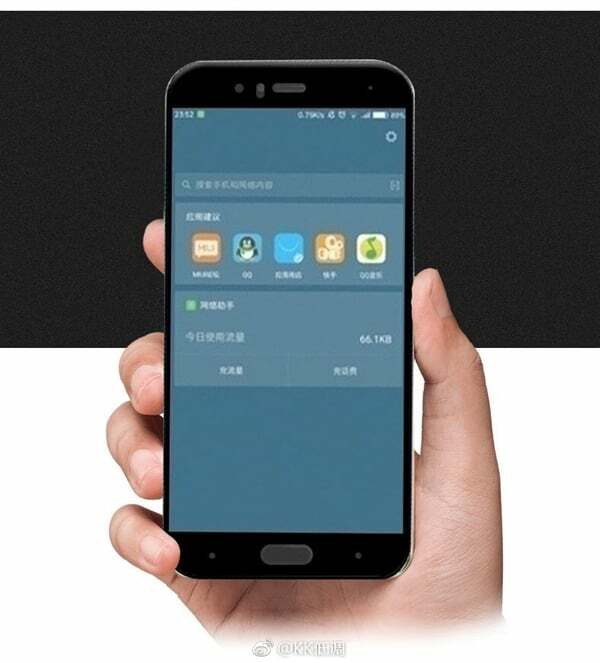 With the Mi 6, Xiaomi is planning to embed the fingerprint scanner into the home button of the phone, which will be flanked by two hardware keys for accessing back and recent apps menu. Earlier rumours suggested that the Mi 6 will come in two variants- the standard Mi 6 and a bigger Mi 6 Plus option. The Mi 6 Plus might arrive with a dual camera setup at the back, overclocked version of Snapdragon 835 SoC, 6GB/8GB of RAM, and a beefy battery. On the other hand, the Mi 6 will come with the same 5.15-inch Full HD display as the Mi 5, Snapdragon 835 SoC, 3GB/4GB/6GB of RAM, 12MP rear camera, and a smaller 3000mAh battery. Xiaomi is yet to announce the launch date of the phone, but rumours say that it will be published sometime in second half of April.